I remember over a year ago, after completing a route around the 10 highest mountains in Scotland, a friend asked me in jest, what’s next? I had loads of unfinished grand schemes here in the UK, but the first thing that came out of my mouth was “Iceland.” I remember her laughing at me, and giving me a look that required no explanation of “You’re off your head.” I get that a lot. Anyone that knows me realises that if I mention I am going somewhere, it inevitably involves mountains or some sort of ridiculous challenge that is normally completely illogical to most people, and probably quite rightly so. 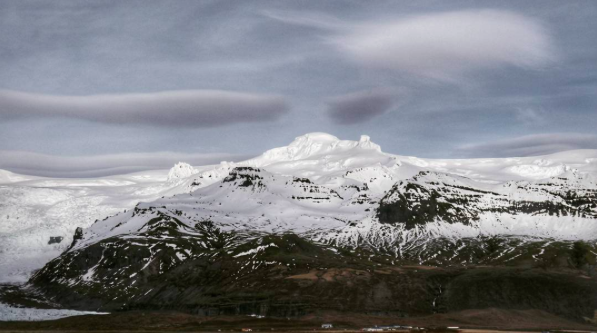 Hvannadalshnúkur, Iceland’s highest mountain on a rare day it wasn’t in cloud. In truth, I’d been eyeing up Iceland for a while, but never had the chance, or rather hadn’t taken the chance to put a plan into action. The volcanic landscape is what initially attracted me, and as Mountaineering became more a part of my life, I realised the potential that Iceland offered. My friend was right though, from the outset of planning, the first thing I googled was “Icelands Highest Mountain” with Hvannadalshnúkur coming back (pronounced something like Vanna-dalsch-nok-er). Of course, why start small. It’s much like other challenges I put myself through, a bit all or nothing kind of approach, which so far, hasn’t gone too badly. At 2210 metres though, it was by no means the highest mountain in Europe, but it was on the largest Glacial cap in Europe, as well as being the longest summiting day in Europe, with the ascent to the summit being from sea level and completed in a single day. In all it usually takes about 16 hours with 2150 metres of vertical ascent. I’m sure my eyes would have lit up at this, it already sounded like my sort of thing. For someone relatively new to Mountaineering though, it was quite a step up. 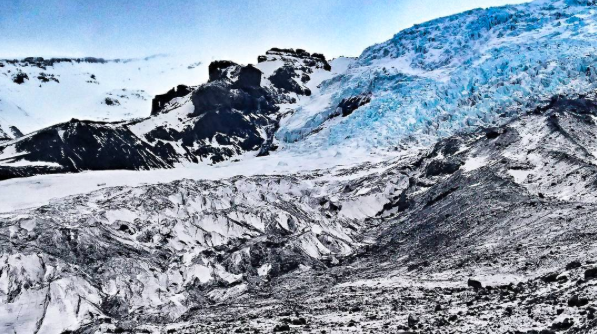 Falljokull Glacial tongue (“falling glacier”) where I spent a day exploring whilst waiting for the winds to drop. I researched in depth and found that the best weather window to summit Hvannadalshnúkur is from April to June, with the weather being too severe before, and too warm after, leaving massive crevasses exposed by melting snow bridges. The Glacier was definitely going to be a slight issue, and there was a lot of it to be traversed. For once I saw a bit of sense, mainly due to Jo (my other half) being the voice of reason, and I booked a guide from Icelandic Mountain Guides. I know that Glacier travel is always risky, and ill advised to do it alone, so probably just as well I did. To give myself every chance of success, I did all I could to prepare myself for this challenge. Previously I think stubbornness and the fear of failure had got me through my other excursions. A good friend wrote me a training program, and for a year before my planned ascent, I started training. I was a sporadic runner before, and did run occasionally, but this time I had to knuckle down and start doing it properly. I must admit, I had always found running mind numbing, but eventually I found that there was a great amount of escapism with it, and a great way to blow off steam by thrashing about trails and country lanes. I started to enjoy it, and even got engrossed in the training to the point it became a bit of a mission itself to try and improve my goals. I even squeezed in trips to Wales and Scotland to try and tackle multiple summits in a day. For most people, training this far in advance is unnecessary for this sort of challenge, but it gave me something to focus on, and I had a theory that if I could prepare my body properly, I would be able to concentrate more on the psychological side of this climb, without having to worry as much about the physicality of the challenge. As with everything, I got carried away and started listing multiple other summits in Iceland, nearly losing sight of my goal, and probably giving myself cause for frustration by over committing. There is no way I would achieve all the mountains I had written down, and needed to try and strike a sensible balance, as well as not burning out for the main event. I had also invited Jo to come with me, trying to make it into an expedition/holiday for us both. She also thinks I’m mad, and often reminds me. Months flew by, and we were soon heading to Iceland. Everything was relatively straight forward, summit day being booked for the 6th of April. We landed in a cold, but sunny Keflavik. The following day, I was introduced to the Icelandic weather. It truly is as unpredictable as they say. Glorious sunshine to biblical winds and driving rain. The five hour drive to Hof was horrendous. Over the days leading to the summit day, the weather didn’t get much better. The winds kept me off the mountains, I was confined to glacial walks, smaller summit attempts and sightseeing. Thursday saw the return of winds hitting 80 mph gusts, and my summit day was postponed to the Saturday. I can tell you by now I was twitching and getting irritable with being grounded. Not only with being reduced to scampering around with other tourists, but because I simply could not get into the Mountains at all. I imagine, in fact I know, I was a nightmare to be around by now. The weather stayed in, and Saturday was looking hopeless, but thanks to the effort of the Icelandic Mountain Guides, they moved it to Sunday. I attended their hut on Saturday night for a pre-climb brief, only to find the other climber had since backed out due to the weather, but as a bonus I would now have two guides, Bjartur and Dieter. Prepped, briefed and ready to go for a 4am start. I had all my gear with me, and was supplied with Snow shoes. The conditions on the plateau were expected to be deep snow due to the amount that had fallen this week. In hindsight, we would not have made it at all without snowshoes. I was warned though, that we may not make the summit due to the incoming weather, and because of the amount of snow that had already fallen, we could essentially be wading to the top. I didn’t sleep too well that night. I think the weight of expectation I put on myself didn’t help, and then you start clock watching when you’re trying to sleep, which just adds to the sleeplessness. Regardless of my minimal sleep, I was up at 3 o’clock, and met the guides below Sandfell Moutain. The rain had come in, and the walk started head to toe in waterproofs. Sandfell was Sand by name and nature, being a case of one step up and two down. A great wake up call. It was frozen in places and progress wasn’t too bad as we got higher. After about half an hour, Bjartur stopped and said we had completed that section a lot quicker than usual; he was still unsure if we would summit, but we would at least try. My heart was in my mouth, not through the effort exerted, but anxiety. I simply had to make this climb. Bjartur of the Icelandic Mountain Guides, roped up and leading the way across the glacier. We ploughed on into deepening drifts, with the rain now turning to snow, and still coming down persistently around us. We were still making good time, but now came the part Bjartur had warned of the day before. This section was a huge climb, from 700 metres to 1700 metres and just one long series of hill and false summits whilst trudging through snow. Not just physically hard, but psychologically daunting. 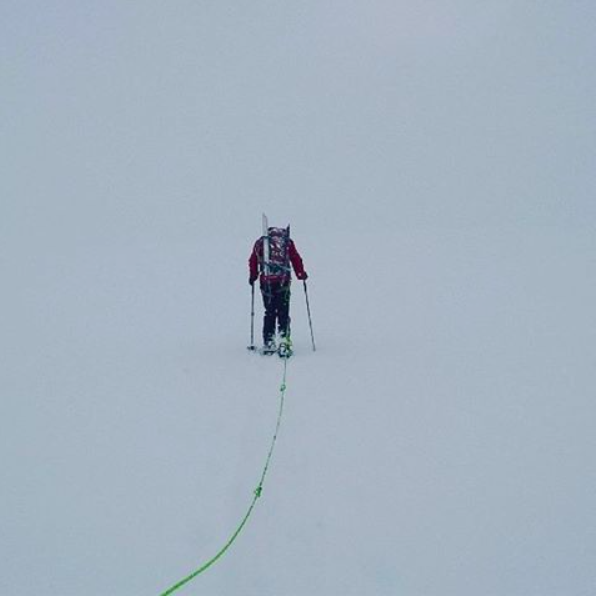 Quite fortunately we were in a white out, and his gruelling section wasn’t as bad as I feared, as I had no comprehension of distance, elevation or time. On the way back down I had a clear view of the route we had done. It seemed infinite enough descending it, I can’t imagine climbing it knowing how far there was to go. We made a few stops to allow our calves to recover from the harsh elevation gain and ever deepening snow, until we reached the start of the glacier just below the plateau. The area is littered with crevasses of unknown depth, and essentially it’s a criss-cross and guessing game as to where some of them where. There are at least six major ones that would be crossed, fortunately the snow that was hindering us also filled them to aid us with crossing them in relative safety. Snow shoes on, harness on and roped up, we completed the short ascent to the plateau, and navigated in almost a banana shaped route to avoid the edge where the glacier slipped down the mountain. The plateau, as the name suggests, was quite easy going, and the snow shoes made easy work of the crossing. For me though this was the most laborious part. Having just under taken a mighty ascent quite quickly, this bit just seemed to go on forever, with no change in incline, and no visible fixed point from which to measure progress. Despite the snow shoes, our feet sunk considerably and I was aching a bit from the ascent. It was an arduous task. We had by now left the falling snow behind and entered the cloud that was shrouding the summit. I have a habit of summitting mountains in cloud, so I certainly don’t do it for the views. Thankfully the plateau finally started to curve upwards, and the cloud thinned, partially revealing the steep route onwards to the domed summit. Usually this was the time to fix crampons, but simply the depth of the snow meant it was completely impractical to do so. 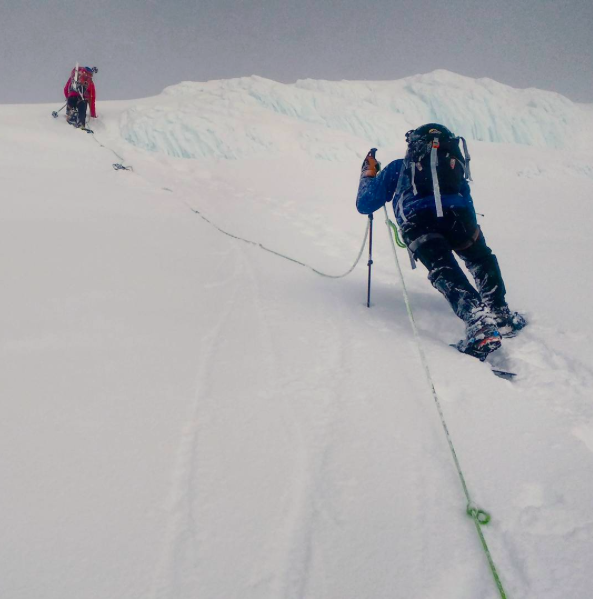 Either use crampons to grip onto the ice which was a few feet bellows us, or stick with the snow shoes to ease the progress, but then reduce our grip on any ice patches or steep climbs. We soon found out the latter when we stuck with snowshoes. 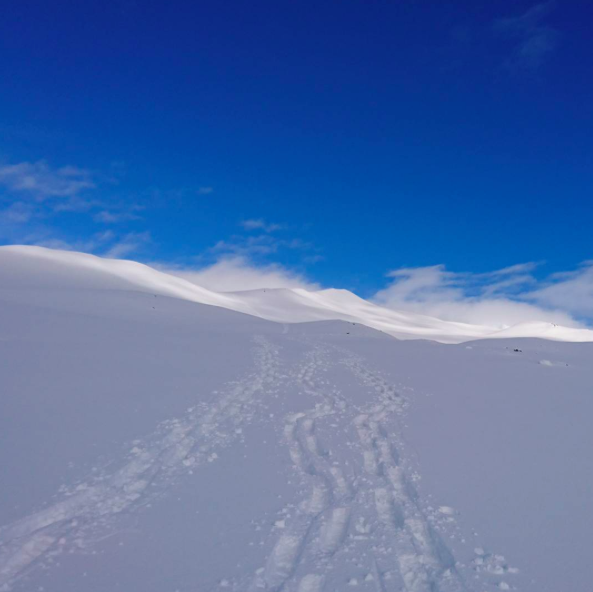 We ploughed on with the snowshoes, and the elevation suddenly kicked up, with the steeply stacked snow on the slope slipping beneath our feet. The snowshoes eased progress, but digging into snow on a steep incline was hard work, and simply pushed the ground from beneath our feet. Bjartur on the rope ahead of me gave indications of the larger crevasses to be aware of, I tentatively followed, convinced by the safety as Bjartur had just skipped across them, but none the less very aware of their presence. A steep scramble up a section of ice and sheering snow. 200 metres below the summit, Dieter started an elevation countdown as we neared. This was soon interrupted as we reached the frozen summit mass. Words can’t describe the sight of this after such a long climb, but even more so as our route was blocked by solid ice and a sheer cliff on one side, and what looked to be an unstable crevasse on the other side to the summit. The only option was a small section a couple of metres wide, consisting of deep snow and hard ice. 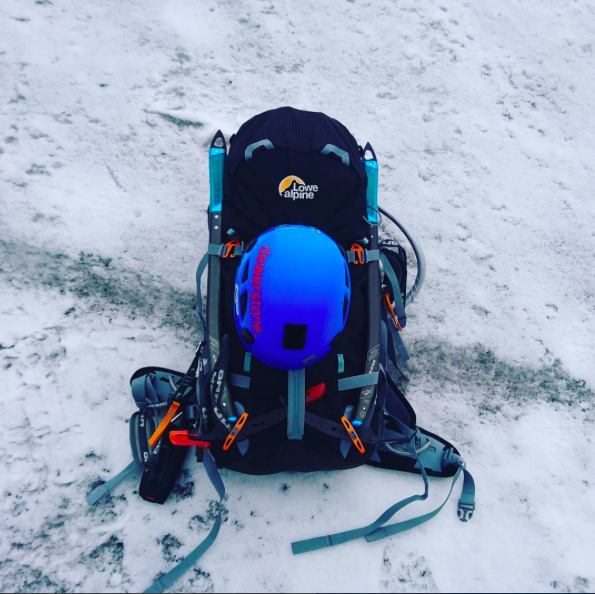 It was by now too late to revert to crampons as there was no suitable place to stop to strap them on, the consequences of doing so would have surely meant slipping back down the steep section we had just ascended, and to the Crevasses below. Bjartur led the way, climbing with snow shoes and one ice axe on a slope that must have been between a 80 - 70 degree incline. Climbing in snowshoes is not exactly easy, and it involved kicking at the ground with all the force you could muster to try and get some purchase on the ice with the small spikes on the toe. This was made increasingly difficult by the fact that we only had one ice axe each, and then made even worse by me losing my left snow show. I pretty much climbed one handed and one footed, but was gratefully aided by Bjartur belaying me up from his perch on the ice. I felt relieved half way up when I passed his stricken snowshoe that he had lost. At least it wasn’t just me. Dieter, armed with his own snow shoes, and ice axe, and now two extra snow shoes on his other arm, made quick work of the same section. I’d like to think we somehow softened it up for him. There were smiles all round when we made it pass this section. We carried onwards with kinder terrain. By now my legs were starting to ache. Bjartur joined in on the count down, “60 metres.” That was possibly the longest 60 metres of the day until finally he let out a huge “WHOOP” followed by a massive fist pump. We’d made it. There was a definite feeling of relief, jubilation and for me disbelief. The whole build up to this climb had looked doomed, yet here I was on the summit of Iceland’s highest peak. I couldn’t quite take it in or comprehend that we had done it. Dieter then jumped in and took a group photo, followed by Bjartur and, not to be left out, Me. Bjartur radioed in to their hut to inform them we had made it, Dieter translated for me, saying that their colleagues couldn’t believe we had made it, anticipating we would turn back before half way. After a quick break, we moved again. Stopping for any amount of time meant putting more layers on, and we already had every layer on. The temperature now was around -10 at the summit, made worse by the wind chill and that we had sweated heavily on ascending despite the cold. Gore-Tex only breathes so much. We descended via a different route, edging around a crevasse which was more visible from above. The descent is always the worst bit. You’re already tired, and you really have to concentrate on your footing. In that amount of snow it’s also hard to pick out the terrain. The slope we descended was very steep, and again the snow shoes helped and hindered at the same time. Bjartur seemed un-phased and took it in his stride. I followed the best I could with a few slips and trips. It was Dieter who slipped first, although he had enough time to casually tell us he was self-arresting, and dug his ice axe in to stop himself. Easily the most casual fall you will ever see. I followed soon after with a much more rapid self-arrest with my ice axe. I’d say I wasn’t quite as casual about it as Dieter. The precarious slope didn’t last too long, and we made it back to the plateau. Descending the Mountain in glorious conditions, only our tracks in the fresh snow. Yet again this part was mind numbing, but it was brightened by occasional glimpses of views through the cloud, with peaks of other mountains starting to become visible. As reward for again slogging across this part, the cloud lifted. All of a sudden, the sun came out, and we were greeted with outstanding views across the shoreline of south Iceland, views of the Hrutsfjallstindar Peaks and to top it all, the best view in Iceland of the massive Vatnajökull Glacial cap. The snowshoeing back down was an absolute delight, and my highlight of the whole trip. Yet again the Icelandic weather changed, with a stark contrast from earlier. Layers off, sunglasses and sun cream on, we descended in sunshine back to the start point. I cannot describe the feeling of elation and achievement afterwards, I didn’t want it to end. After just short of 12 hours, we had completed the ascent, 3 to 4 hours quicker than planned, and in a variance of conditions that gave us just about everything you could have expected, and wanted, whilst Mountaineering. Its only now when writing about it that I realise how much we battled through those conditions and reached the summit, but what an experience it was. I gained a lot from this trip, not just what I’ve learnt from the guides and the climb, but what I learnt about myself. Each trip you should take something away and learn something new, and for this one I will use it and apply it to my next venture when I return to Iceland. Photos by myself and Dieter of the Icelandic Mountain Guides.